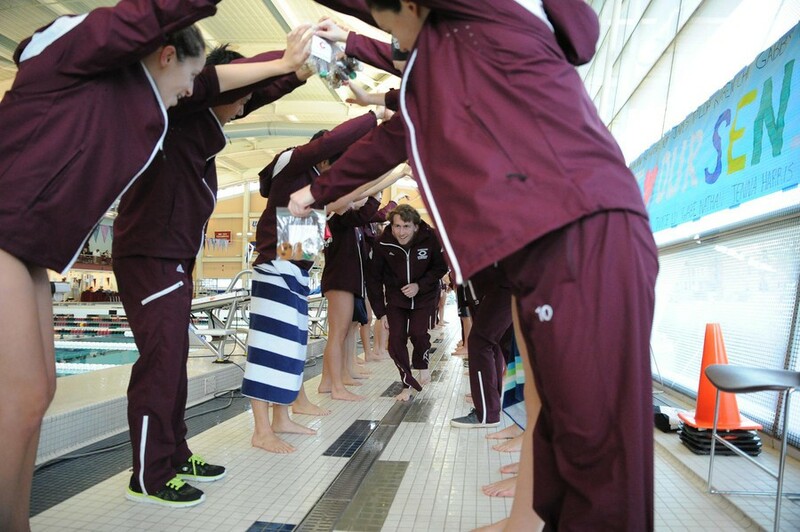 The Maroon swim & dive team gets hyped up for their meet. After a two-month dry spell, the Maroon swim and dive squads kicked off an action-filled weekend at Myers–McLoraine Pool Friday evening. In the first meet of the quarter, the men and women hosted a tri-meet featuring Lewis University and Olivet Nazarene University, before heading north on Saturday to face D1 rival UW–Milwaukee. Despite six event victories, the men split Friday’s tri-meet, defeating Lewis but falling to ONU. First-year Reona Yamaguchi was first to the wall in the 100-yard breast stroke, the first of his four weekend victories. Other standouts included first-year Taye Baldinazzo winning the 1000-yard freestyle and third-year diver Dean Boures, leading the field in both the one- and three-meter dives. Tallying six event victories of their own, the Maroon women cruised to a sweep in their first action since winter break. Top performers included first-year Michaela Mullison, second-year Hannah Eastman, and fourth-year Abby Erdmann, placing first in the 200-yard butterfly, 200-yard breast stroke, and 500-yard freestyle respectively. Second-year Anna Girlich and third-year Natalie DeMuro shined on the board, with Girlich capturing first in the one-meter dive and DeMuro achieving an NCAA provisional score on her way to first-place at three-meters. The fourth-year studded relay featuring Alison Wall, Abby Erdmann, Maya Scheidl, and Megan Wall added the finishing touches, capturing first-place in the 400-yard freestyle relay. Amidst a host of strong efforts, the Maroons’ well ran dry against UW–Milwaukee with the men falling 138–160 and the women being outpaced 105–186. The women failed to record an event victory, tallying twelve second-place finishes on the day. In addition to her new school record in the 100-yard IM, Scheidl brought home second in the 100- and 200-yard freestyle races. Girlich continued her success on the board, finishing second in the one-meter dive while first-year diver Agnes Lo placed second at the three-meter height. On the men’s side, Yamaguchi led the way, delivering first-place finishes in the 100- and 200-yard breast stroke while setting a new school record in his 100-yard IM victory. First-year Aaron Guo recorded three first-place finishes of his own, while Baldinazzo claimed his second first-place finish of the weekend in the 200-yard freestyle. First-year Byrne Litschgi also found himself at the top of the podium, winning the 200-yard backstroke for the Maroons. The Maroons resume action at 1 p.m. this Saturday as they host DePauw University and Calvin College in the final home meet of the season. The men will have their hands full as they welcome the No. 20 Calvin Knights and No. 14 DePauw Tigers to Hyde Park. On the women’s side, the Knights and No. 22 Tigers will be looking to rebound, with both teams coming off weekend losses. The conclusion of the annual tri-meet will mark the beginning of a two-week hiatus for the Maroons before UAA Championships begin on February 8.